Enjoy maximum comfort and ultimate relaxation while cruising the beautiful Caribbean, Panama or Canada & New England. Enjoy a picturesque cruise on board the Caribbean Princess. You will be exploring the best of the Caribbean islands, sailing through the world wonder that is the Panama Canal and learning all about the fascinating history of Canada & New England. Cruising with the whole family? The Caribbean Princess caters to absolutely all ages. Children will love roaming around the 'Tree House' or 'The Lodge' where they can play, take part in some great activities and make new friends, while the adults enjoy some relaxation. There are also numerous opportunities to stay fit while on board, why not challenge family or friends to a game of basketball or practice your putting skills on the golf course. 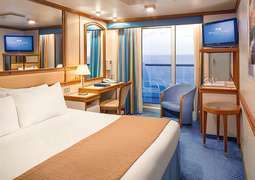 The accommodation on the Caribbean Princess ranges from affordable, yet spacious Inside Cabins to the ultra-luxurious Suites. Guests staying in Suites gain exclusive access to a Club Class Lounge with refreshments and more. There is a wide range of bars and restaurants on board: go traditional at the main dining room or opt for 'Anytime Dining' around the clock. You are sure to be impressed with the flexibility offered. The completely refurbished and beautifully enhanced Caribbean Princess offers a choice of diverse Suites, Balcony, Outside and Inside Cabins. No matter which category you choose, all cabins are comfortable and have all the modern amenities you can think of. 'The Princess Luxury Bed' with its scientifically engineered mattress and bed springs is available throughout the cabin types and will ensure your overall wellness and ultimate comfort. The entire Princess fleet is proud to be part of the gastronomic society, “Chaîne Rôtisseurs” and the Caribbean Princess is no exception. The food on board is prepared by First Class chefs. You can look forward to creative dishes and regularly changing menu presentations. Dine traditionally at set times and enjoy the service of your personal waiter, or eat whenever you please with 'Anytime Dining'. Real gourmets are invited to sample exclusive dishes from all over the world in the specialty restaurants, such as 'Sabatini’s Italian Trattoria' or the 'Crown Grill'. The Caribbean Princess offers plenty of casual bistros, cafés, and bars for snacks and drinks at any time, which you are also welcome to enjoy while lounging by the pool. Enjoy countless activities, courses, shows, informative lectures, workshops, and exhibits on board the Caribbean Princess. There is also a fully-stocked library, internet café and photo studio. Why not embark on a shopping spree in the duty-free shops, swim or play golf during the day and enjoy great evening entertainment with all the latest films or fantastic Broadway-style shows in the Theatre. A casino and many different lounges and nightclubs offer even more entertainment after sundown. Kids and teens are invited to check out the kids’ and youth centers, that are well-equipped with films, video games, table football, jukeboxes, and board games. There is also diverse entertainment programming for all age groups in the 'Treehouse', 'The Lodge' and the 'Beach House'. Set your spirit free with a luxurious visit to the Caribbean Princess’ 'Lotus Spa' wellness area, where different pools and whirlpools are all warmed up to help you relax. The 'Lotus Spa' also houses a state-of-the-art fitness area with the latest equipment, classes and personal training, among other features. The adults-only 'Sanctuary' offers a relaxing environment allowing for peace and quiet. The dress code on this ship is generally casual. You’re free to wear whatever makes you feel best. However, the dress code becomes smart-casual once the sun goes down, and elegant and formal clothing is recommended for special occasions. The cruise ship Caribbean Princess is one of those super-sized cruise ships! The impressive Princess Cruises ship stands at 951 feet in length and 118 feet in width. It has a gross weight of 113,000 tonnes, and it can carry up to 3,100 passengers. A team of 1,200 strong crew members makes sure that all guests are well taken care of during their trip. The ship has four swimming pools, and there is a pool for children as well. You can book a cruise aboard the Caribbean Princess with CruiseAway, and we will ensure that you get the best price available. The cruise ship traverses exotic regions such as the North American coasts, as well as the Caribbean and Asian waters. You can book a cruise on the Caribbean Princess with CrusieAway, and the trip of your life will be assured. You may also take your family along with you, so your dream voyage can be cherished for years to come. The dining facilities are similar to those of other Princess ships in the same class. The passengers may opt to go for either of the two traditional dinner seating times. They may also choose to go for the early-bird seating in an assigned dining room. There are also the Crown Grill and Sabatini’s restaurants, which offer reservation-only services; both restaurants charge extra for their services. There is also ice cream on offer to passengers, as well as the coffee bars that offer a variety special treats. In total, there are nine bars, two speciality restaurants, three dining rooms, a buffet, a pizzeria and an ice cream parlour. Dining has never been this exciting, and every single meal will be a new experience aboard the Caribbean Princess. 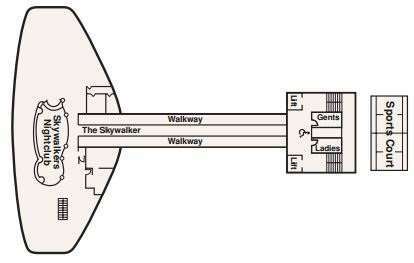 You may choose to spend the night dancing away at Skywalker’s Disco. You and your loved-ones are assured of a gastronomic treat aboard the stunning Caribbean Princess. 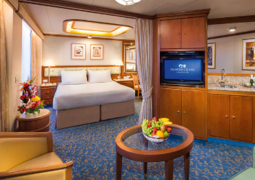 The ship has a total of 1,557 cabins to choose from. 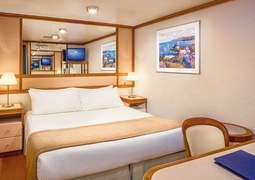 The Caribbean Princess has two family suites that are interconnecting staterooms; each of which have their own balcony and accommodate up to eight people. 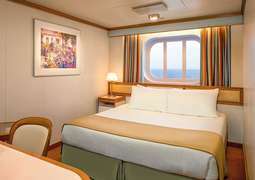 Most of the other staterooms will hold between three and four people. A number of adjacent cabins can be interconnected via adjoining doors. Make sure that you get the best prices for the most luxurious cruises on the planet by booking through CruiseAway. Our ‘Best Price Guarantee’ means that we simply won’t be beaten on price. Finding the cruise of your dreams is as simple as the click of a mouse, as our user-friendly search option means you only see the cruises that match your exact requirements. CruiseAway is your one-stop-shop for luxury cruising, and deals on the Caribbean Princess are the best around! The Caribbean Princess is part of Princess Cruises fleet. If you require more information please call our cruise expert on 1300 887 590.